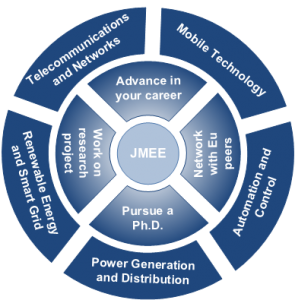 Why Study Joint MSc in Electrical Engineering? Have you thought about pursuing a Post Graduate Degree in Communication/ Electrical/ Power Engineering? Are you planning to advance your career in Mobile/Communication/Networking / or Information Security? Are you planning to advance your career in Power Engineering/Renewable Energy/Power generation and Distribution? Do you want to expand your network and build relations with European peers? Would you like to do part of your research project in Europe? The Joint Master in Electrical Engineering (JMEE) aims to contribute to the advancement of Palestinian Electrical Engineering, by providing technical, scientific, and research skills to students. Graduates would be better prepared to use their skillsets for leadership in the fields of telecommunication engineering and electric power engineering, to meet the – local, regional, and global markets’ needs. The unique degree started in January 2016 at Palestine Polytechnic University and Birzeit University . The programme is taught jointly by International professors from UK, France, Romania and Bulgaria in addition to Palestinian Professors and industrial experts. 1st and 2nd cohorts of students were able to carry out part of their research in these countries and were exposed to advancement research and industrial developments in Telecommunication, especially mobile, and Power Engineering, especially Smart Grids. Graduates have the option to pursue a Ph.D. degree and/or further their engineering, academic, or managerial careers, and are benefiting from a wide range of professional experience from European Colleagues and peers. A Joint Master in Electrical Engineering (JMEE) is delivered jointly by Birzeit University and Palestine Polytechnic University, is part funded by the European Union through TEMPUS program and coordinated by Salford University in the United Kingdom. The program is developed in collaboration with European partner universities (Estia Insistute of Technology, University of Ruse Angel Kanchev and Technical University Cluj-Napoca ), Palestinian Technical University-Kadouri and representatives from the Palestinian industrial sector (JDECO & PITA). The program consists of 36 credit hours, including 15 credit hours of compulsory courses, 15 credit hours of elective courses, and 6 credit hours for Master’s thesis. 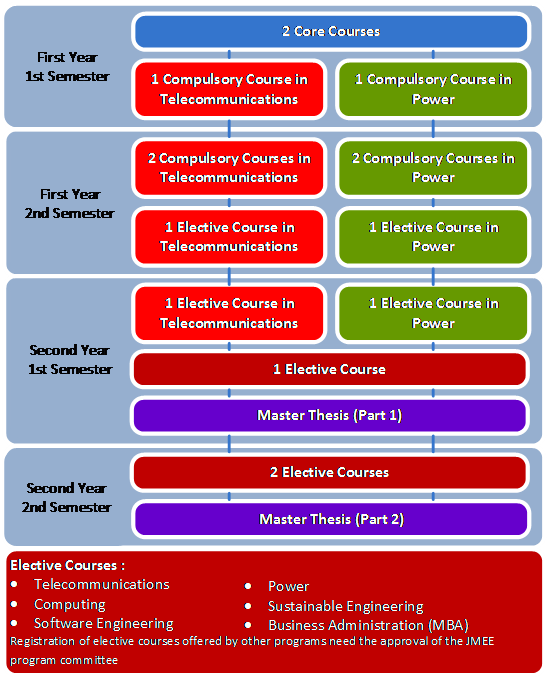 Have a BSc degree from a recognized university with a very good standing in one of the following disciplines: Electrical Engineering, Electronic Engineering, Communication Engineering, Power Engineering, Renewable Energy Engineering, Computer Systems Engineering, Computer Engineering, or Mechatronics Engineering. Provide two sealed recommendation letters. Personal interview with the program committee may be required. Application & Registration: The application and registration procedure for JMEE degree will be published on the websites of both universities. Please follow this link to access the application form and see below links for the contact details of the leading academics for further enquiries. (www.birzeit.edu) and PPU (www.PPU.edu) Universities. Address: Palestine Polytechnic University, P.O.B 198, Hebron.